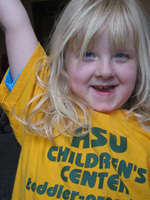 The HSU Children's Center provides affordable high quality child care and early education programs in support of HSU students, staff & faculty families. Our center is located on campus at 14th and A Streets. Hours are 7:30 a.m. to 5:30 p.m. during the academic year. The Children's Center is open most of the year, please review our calendar for the times we are closed. Children's schedules are created based upon the individual needs of each family with full and part-time schedules available. Requested schedules may be modified to meet the needs of other student families and the requirments of our funders. Our Children's Center is a department within Student Affairs. We have a Center Director who oversees the entire program, and an Assistant Director who is responsible for staffing and the implementation of the classroom program. 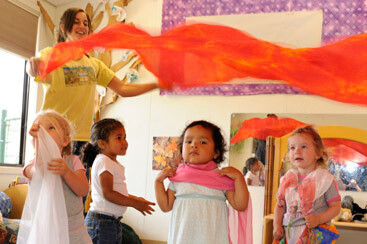 Credentialed Teachers coordinate the children's programs in each classroom. Staff work as a team. There are Supervising Teachers in each center who oversee health & safety issues as well as support each classroom teacher. All teachers hold Bachelor's degrees and have extensive course work and experience in early childhood education. Employed university students provide additional classroom assistance. Many of our student assistants are Child Development majors, and many have Child Development permits qualifying them to work as teachers. We also provide extensive training and supervision for all student staff. 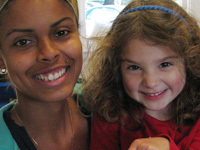 For student families, child enrollment is based upon family income. Our sliding fee scale is based on family size and gross monthly income. Fee subsidy is provided by a Department of Education grants and Federal grants. Student families not elgible for grant funding pay a reduced fee for services. Fall semester registration is scheduled for the last two weeks in July. Spring semester registration takes place during the first week in January. Summer registration begins May 1st. Click here to add your child to the waiting list. For more information, please contact the center office (707) 826-3838.